Cognitive behavioral therapy (CBT) focuses on a person’s thoughts, feelings, and behaviors to identify unhealthy patterns. The patient and therapist then develop appropriate healthy patterns of thoughts, feelings and behaviors to replace the unhealthy patterns. Dialectical behavior therapy is a form of CBT that puts a specific focus on a person’s arousal response to certain emotional situations. A case study of cognitive behavioral therapy (CBT) to treat misophonia in a young woman reported elimination of impaired social functioning at the end of treatment and at four-months post-treatment, although the woman still found the trigger stimuli unpleasant. [i] The treatment plan included “(a) a cognitive component to challenge dysfunctional automatic thoughts, (b) a behavioral component to interrupt maladaptive and avoidant coping strategies and practice helpful ones, and (c) a physiological component to help recalibrate her autonomic reactivity.” This last component was thirty minutes of exercise a day, and it was unclear whether the patient did this or not. 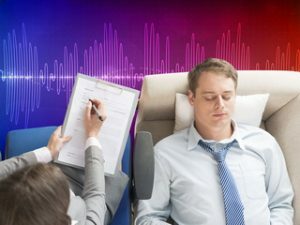 It seems as if the individual still did not like the sounds because she was still triggering to them, as this treatment did not address the physical reflex. But if the individual could remain calm, then perhaps with time the physical reflex would decline. This needs more research. A second case study was reported on CBT treatment for two youths with misophonia ages eleven and seventeen. [ii] The treatment in this study included psychoeducation about misophonia and focused on helping the patients develop the ability to tolerate triggers without aggressive or avoidant behaviors. The treatment included a progressive exposure of trigger severity with the child working to reduce both their emotional and outward response. This allowed the patients to develop the ability to tolerate the triggers and remain calm. A reward hierarchy was provided for the younger patient for completion of the exposure steps. Cognitive restructuring was included to address dysfunctional beliefs about the sounds, such as “my family makes these sounds to annoy/aggravate me.” Both youth progressed though treatment and were able to eat with their families without accommodations. Both youth showed a reduction of their misophonia severity at the end of treatment based on a self-report questionnaire, though the decline for the younger child was fairly small. The study did not include any follow-up measures for the youth which concerns me. My concern about this treatment is that it used an enticing reward for the younger child. The reward may have motivated to the child to learn to control his emotional and outward reaction to triggers without really eliminating the unpleasant, disruptive effect of being triggered. I have a report from one parent where the child learned to control his “acting out” to triggers to earn a highly preferred reward. The treatment appeared to be a complete success. But about a year later, he began again reacting to triggers with explosive behaviors. At this point, his outward behaviors and emotional response were more extreme than before the treatment, and he had several new triggers. It appears that while he was outwardly in control, the distress he was experiencing from being triggered allowed the new triggers to develop and reflex of misophonia to strengthen. The risks here are discussed more fully on the page How Triggers Spread. It is very beneficial for a person with misophonia to learn to remain calm when triggered. This seems to address the Conditioned Emotional Response (CER) to triggers, but this does not eliminate the initial physical reflex. This can work very well for adults and older youth who are motivated to eliminate the extreme, disruptive, and debilitating effects of misophonia. For motivated adults, the reduction in misophonia severity with CBT will likely be long-lasting. CBT can help reduce the emotional upheaval that comes with misophonia, and there are many anecdotal reports of individuals benefiting from this form of treatment. CBT or similar therapy is also recommended by the Misophonia Management Protocol to help a person change the way they think about triggers and live with misophonia as a chronic condition. I think CBT should be considered a viable treatment for misophonia, provided the CBT therapist is experienced with misophonia treatment.